U.S. Army Capt. 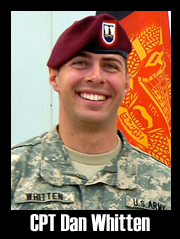 Dan Whitten, 28, of Grimes, Iowa, assigned to the 1st Battalion, 508th Parachute Infantry Regiment, 4th Brigade Combat Team, 82nd Airborne Division, based out of Fort Bragg, North Carolina, died Feb. 2, 2010, when enemy forces in Zabul, Afghanistan, attacked his vehicle with an improvised explosive device. Whitten is survived by his wife, Starr; his mother, Jill; father, Dan; and sister, U.S. Army Capt. Sarah Whitten.